"He Who Watches Over" is a portrait of a man with Cherokee ancestry who has been adopted as a brother by his Ojibwa friend. He has spent much of his adult life researching and passing on accurate information regarding the lives of Native Americans during the “Olden Times”. 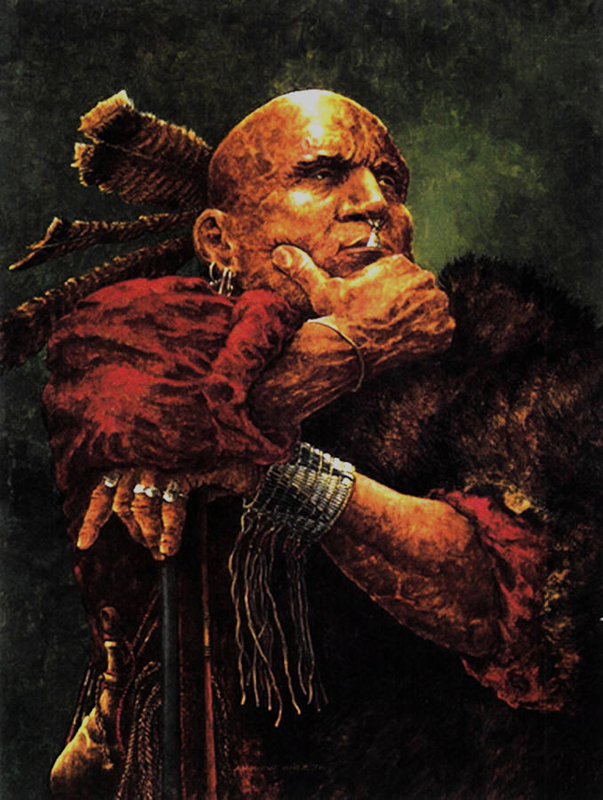 His shaved head, trade shirt, nose and ear jewelry, wampum bracelet, trade gun and powder horn are all typical of the eighteenth century in the area known as the eastern woodlands of North America. His name was bestowed upon him by his friend when he was adopted. In the olden times, a child usually received a formal name at about the age of seven or eight years in a ceremony known as “Praying Over The Child”, but it was common practice to change a person’s name two or three times during his lifetime to one which was more suited to his character.